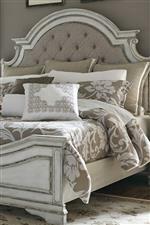 Pairing a grand elegance with an aged white finish results in a uniquely charming personality in this queen sleigh bed. Paneled sections are framed by wood molding to help define the pieces character while the subtle curves of the sleigh design provide a more traditional feel. Bracket feet complete the traditional elements while the light, rubbed through finish, provides the piece with the perfect cottage style to build your bedroom around. The Magnolia Manor King Sleigh Bed with Antique White Finish by Liberty Furniture at Miskelly Furniture in the Jackson, Pearl, Madison, Ridgeland, Flowood Mississippi area. Product availability may vary. Contact us for the most current availability on this product.